Here are two moderately interesting, related facts (I have really sold this piece to you, haven't I). Second: The Treasury and 10 Downing Street are concerned that the banks were ambushed in June by the regulator, the Prudential Regulation Authority, with the unexpected imposition of a new constraint on how much they can lend relative to their shock-absorbing capital, or what is known as a leverage ratio. Now to be clear, it was the surprisingly early implementation of the leverage ratio, not the fact of it, that upset members of the government and Whitehall. The point is that the Treasury believes that banks have to be set clear and stable rules about how they are to be judged, and then properly held to account for their behaviour - especially whether they are supporting the economy by providing adequate credit and conducting themselves in a respectable way. But if the regulator keeps moving the goalposts for the banks, especially on something as important as how much capital they have to hold as protection against future losses, then it is perhaps understandable when banks' boards are a bit confused about what is expected of them. In the case of the leverage ratio, the banks had no idea it was coming their way until a few days before the end of a review of how much capital they need to hold as measured by another set of rules, the notorious Pillar 1 Basel rules. (Please don't lose the will to live at this juncture; probably all you need to know about Pillar 1 Basel is that it is fiendishly complicated and that banks' cynical exploitation of its earlier version is blamed by many for the banking crisis of six years ago). As I understand it, the PRA's chief executive, Andrew Bailey, has told colleagues that neither Barclays or Nationwide will be allowed to shrink their creation of credit. Anyway, the link between my two mildly diverting statements above is the Treasury's firm belief that the Bank of England needs a thorough culture overhaul, so that it doesn't feel tempted to re-write the obligations they place on banks in a way that can be seen as capricious and unpredictable. It was precisely to change the way the Bank thinks and acts that George Osborne airlifted Mark Carney from Canada's central bank to be the new governor of the Bank of England. The Chancellor was intent that Mervyn King's replacement had to be a proper new broom, which is why all the candidates for that top job bar Carney were no-hopers. As I understand it, the Treasury now believes Mr Carney is in need of allies around him who are not Bank of England lifers. Who therefore is currently the leading candidate to become deputy governor? Well the name that has repeatedly been touted to me is that of a Treasury lifer (don't smirk), Tom Scholar, who is what's known as a Second Permanent Secretary at that most powerful of Whitehall departments and who played an influential role in the bail out of RBS and HBOS in 2008. What you need to know is that the Bank of England and the Prudential Regulation Authority are formally independent of government, in an operational sense, which is why it is so important for the Chancellor that he chooses the very top people at the Bank of England. As I mentioned a few days ago, the new insistence that banks should have a 3% ratio of capital to gross assets (loans and investments) is particularly bothersome for two financial institutions, Nationwide and Barclays, who are not in the naughty corner in respect of supporting the UK's tepid economic recovery. On the PRA's calculations, Nationwide's current leverage ratio is 2% and Barclays is 2.5%, significantly below the new 3% minimum. For Nationwide and Barclays to hit the 3% leverage target, they would either have to raise expensive new capital, which would squeeze their profits, dispose of non-core assets, or shrink their lending. Neither bank is overjoyed about any of this, and feel hard done by, in having done what the government wants by increasing their net lending to households and businesses. What is more, it is particularly unclear how the new capital requirement will be met by Nationwide without to an extent restricting the supply of new mortgages or at least pushing up the cost of mortgages - because, unlike Barclays, it is a mutual with few obviously spare assets to sell and no access to the stock market for capital. As for the chief executive of Barclays, Antony Jenkins, he had the temerity to express his frustration at a conference on Friday, when he muttered about the possibility of Barclays reining in the volume of loans it provides. This has mightily miffed the PRA. A PRA source told me that it would force them to keep lending, and would not accept any plan from them for hitting the leverage ratio that includes a reduction in lending. If in practice they did shrink lending, the PRA would lambast them in public and even - possibly - fine them, said an insider. Chances are we will hear precisely what Mr Bailey thinks about all this, when he is grilled by MPs on the Treasury select committee on Tuesday. 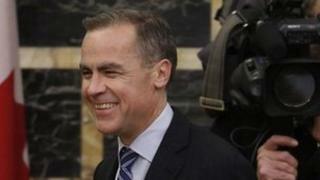 As for Mr Carney, how can he defuse all this tension? Well he could set the deadline for the new leverage ratio as the end of 2014, rather than the end of this year. Given that he has swanked about how Canada's banks survived the great crisis of 2008 in better shape than most others thanks to a leverage ratio less onerous than the Bank of England's new one, it would not be a great surprise if he opted for delay in Britain.